Caroline is a mystic and explorer of the Divine. Over the last 20 years she has studied, trained, and mentored all over the country with master teachers and healers, shamans and priestesses, yogis, cosmic misfits, mystics, pioneers in mindfulness somatic psychology, medium and psychic gurus, and has made many pilgrimages to sacred sites nationally and internationally. Her journey has taught her the power of surrender, trusting in her intuition and inner wisdom, and the importance of community and tribe. Check out the episode below, where we be talk about our quest for Pleasure & Profits and how to discern whether it’s time to press forward or time to rest. You can find Caroline online at carolinepadgett.com. 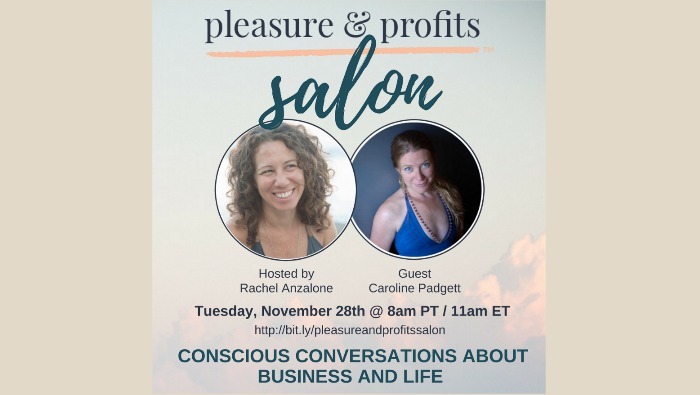 Pleasure & Profits Salon is a free broadcast for women entrepreneurs and lady bosses seeking strategies and inspiration to create alignment in their business and life. Join me on Facebook Live for conscious conversations with women entrepreneurs and lady bosses sharing their own experiences, struggles and strategies around creating alignment and sustainability in their business and life.